The Roanoke Canal Museum & Trail will be hosting a Half Marathon and 8k. 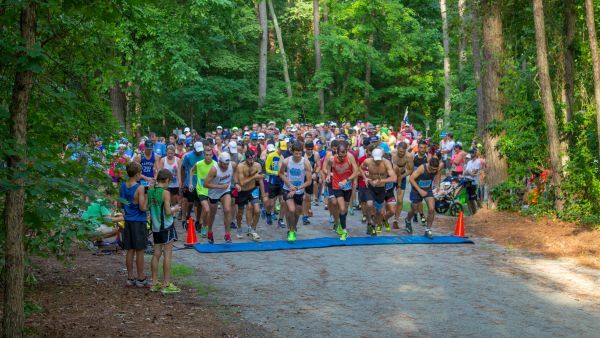 Both races will begin at Roanoke Rapids Lake Park and take place on the Roanoke Canal Trail. The natural surface trail is generally flat with a few hills. As runners travel back in time along the historic trail, they will pass over several culverts that were installed during construction of the canal in the 1820s. Runners in both races will also pass by the large bulkhead that diverted water into the canal during the years it was used to generate electricity for the local mills. Those who choose to run the half marathon will actually run through the old aqueduct, which is widely regarded as an engineering feat well before its time. See the website for full event details and race registration.